Mr. John Kofi Agyekum Kufuor, the former civilian President of Ghana, is not dead. It was initially reported that he died in Johannesburg, South Africa on Tuesday morning following surgical operation on his spine. But Vanguard sources said that Agyekum Kufuor is alive. According New Mail, quoting Reuters, Kufuor was flown to South Africa to receive medication after complaining bitterly about an excruciating pain at the spinal cord. A team of doctors were said to have conducted a second surgical operation on Mr Kufuor’s spine; but unfortunately he passed away just after 45 minutes of the Surgery. Though it’s obvious to provisionally attribute his sudden demise to the spinal problem, doctors have assured the public they will soon release autopsy report to ascertain the real cause. An autopsy will fully confirm the cause of his death, but the best guess at the moment is the spinal problem. Today is a sad day, Mr Kufuor’s death has come as a big shock to his party members and the entire Ghanaian Community, as Ghana is just on the verge of undergoing electoral exercises. 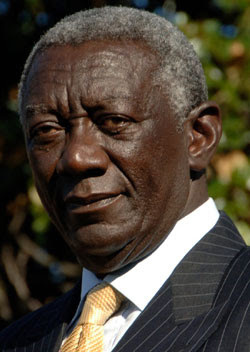 John Kofi Agyekum Kufuor born 8 December 1938 was a retired Ghanaian politician and statesman who served as President of Ghana from 2001 to 2009. He was also Chairperson of the African Union from 2007 to 2008. His victory over John Atta Mills after the end of Jerry Rawlings’ second term marked the first peaceful democratic transition of power in Ghana since independence in 1957.